Squid have eight arms and two tentacles around the mouth, with each arm having two rows of tentacles and four rows on the club ends of the tentacles. 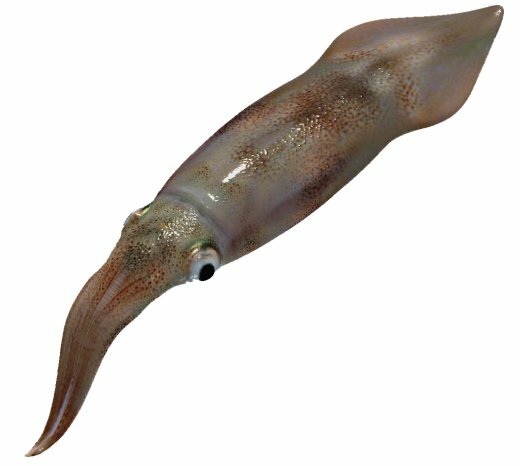 Loligo Squids have an elongate mantle with rhombic terminal fins while Calamari Squid have a more robust mantle with a rounded end and fins that extend nearly the entire length of the mantle. Arrow Squid have a heavily muscled, narrow mantle and tentacles with suckers containing sharp teeth. Southern Calamari squid have been known to grow to 38 cm (mantle length). Various species inhabit NSW waters from the shallow inshore reefs and weed beds to the offshore, open water areas. Mitre Squid have been recorded from northern NSW down to Botany Bay, while Southern Calamari Squid are found throughout NSW usually to a depth of less than 100 m. Arrow Squid are also found throughout NSW waters and live anywhere from the estuaries to 500 m deep offshore areas. May be confused with some Cuttlefish Species.